They have been around but they still don't look like any car or SUV you or I have ever seen. At the 2018 Movin'On by Michelin, the short selection of cars you could drive included the Model X SUV from Tesla. So naturally, at the first possible opportunity, we drove around on the short 2-odd km loop. That's not long enough to make for a full-on first drive but it certainly shows why the Teslas are so highly discussed. While I suspect that the Tesla variant and model range is not quite as confusing as a traditional car manufacturers, they do have a small spread. We were driving the top-of-the-line Tesla Model X P100D model, which includes a performance motor and 22-inch wheels. Tesla offers 5- and 7-seater configurations, ours was a spacious 6-seater. The P100D has a 100kWH battery that's good for 465km on a full charge says Tesla. It hits 100kmph in 3.1 seconds and top speed is 250kmph. The P100D includes the Ludicrous Speed package as well as air suspension. The whole floor hosts the batteries and creates a slightly tall but flat floor. The boot has a deep cubby under the floor cover and the two rear row seats fold down to release more space. The front hood opens to reveal another small cubby hole with a windshield wiper fluid refill cap. Now. Let's climb in, shall we? You 'click' the chrome strip on the door to open it. For the passengers, clicking the chrome strip causes the 'falcon' doors to open. They don't call them gullwings because the door folds as it opens to take up less room in a parking lot. The driver's seat looks skinny from the outside but you sit comfortable and tall. The expanse of glass that stretches from the top of the bonnet to all the way over your head is brilliant to look at. Especially the dark smoke tint on the glass that becomes the roof. On a bright sunny day in Montreal, I got the sense of a car that was almost without a roof and as a motorcyclist, I rather liked that feeling, to be honest. 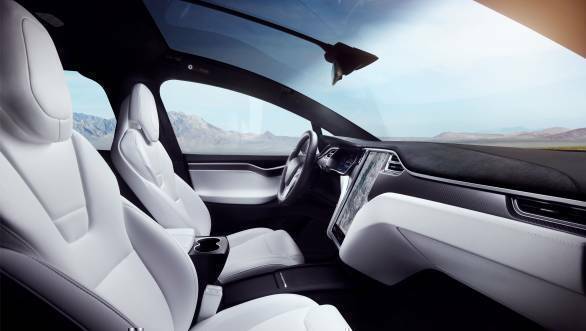 The Tesla interior is different from the norm. A kink in the panel at the top of the inside of the door forms a neat little handle, for instance. The mirror controls are neat and normal but the way Tesla does the instrument screen behind the steering wheel, again, is surprisingly modern - even from the standards of the Germans who all also use all-digital displays. It's a small trick - with clever font and colour choices perhaps, but it works. The dominant element, naturally, is the giant 17" high-resolution touchscreen that controls everything. Tesla has been smart to not clutter the screen with too much and it makes operating it rather easy. A French gentlemen joined me as a passenger and he took to moving around the cabin so try various seats. I did notice how easily the six-seat configuration - with a wide floor space between the middle row - allows him to get around. The gear selector is the more or less the same as the Mercedes-Benz stalk mounted selector in nature and feel. You pull it down into drive mode and the you're ready to roll. No sounds, of course, and you can see how much of the maximum 475km of range you have left. Because the whole floor is a battery, the car feels exceptionally, um, low. The 22-inch wheels don't do much for ride quality - Montreal has some doozies for potholes - but they make the car feel stiff and connected. The steering feels direct also and I suspect that on a fast road, the Model X would hold its own. The disconnect comes from the lack of sound. In fact, my minder, in a Tesla tee, reminded me that everytime we came upon pedestrians, I had to be extra careful because we were making no sound at all. The air-conditoning's fans were the loudest thing in the cabin. Apart from me, of course. 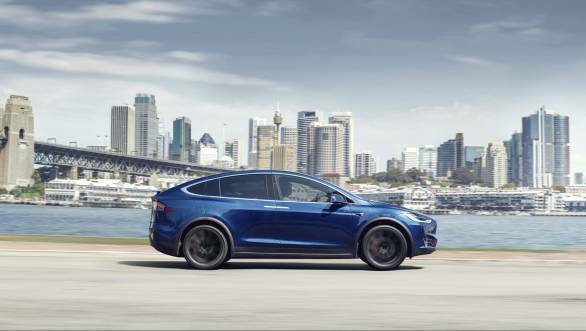 The Tesla Model X P100D with its high-performance motor can go to 100kmph in under 4 seconds, says Tesla. Unfortunately, that will have to wait for another time - there was simply no place to floor the car! But what I noted was a clean, simple feeling car that drove well and the electric motor didn't feel outrageously alien either. The 'engine braking' did feel oddly powerful though. At least a few times, the car came to a stop before I intended for it to without me touching the brakes. My minder - he drives a Model S - says you learn that releasing the throttle pedal in degrees is enough to produce controllable braking and much of city driving can done by using the throttle pedal as both on and off control. 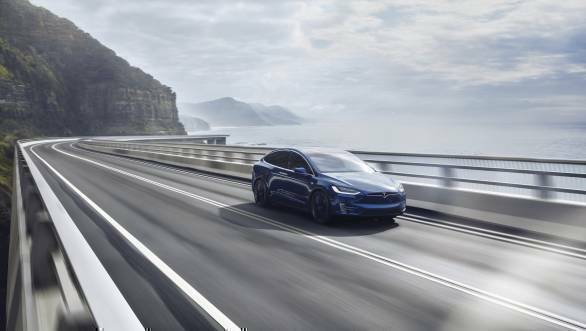 On the flip side, the Model X does offer two regenerative braking modes including a softer one that does, naturally, affect recharge quantity also. The Tesla Model X proved to be an impressively quiet, effective car in my short drive. With all the options as I drove it, it's a USD 200,000 car. And of course, all Teslas today come with the hardware needed for automated driving and have excellent safety ratings too. But ultimately, the thing that stays with you as you step out isn't the numbers or the technology or all of the other Musk-have factoids. It's the fact that the Tesla SUV feels like a genuinely re-thought SUV, as a product for people as well as a new iteration of an existing type of vehicle.